Figures of Taxidermy - Perfect for the curio collector! We have specimens ranging from taxidermy, bones, and wet specimens. Have a fancy friend who enjoys wrapping themselves in furs? We got you! Can’t decide what to get? Join our Curio of the month club! Our taxidermy tends to be a little bit more on the expensive side for our gift guide; with small specimens starts at $150 and our beautiful birds at $320. Hanging bats would be our best seller with our tiny new specimens starting at $30 (but they are selling out quick!)! If those don’t fit the ticket, we have a variety of furs and tails starting at $15, where you can choose from rabbit, fox, and even wolf! Of course, we pride ourselves at Oracle for working as ethically as possible, sourcing our specimens from local farmers, abatement programs, and natural death… so make sure to ask us and we can tell you where your specimens are coming from! Figures of Osteology is one of my favorites with a variety of beetle cleaned skulls we do ourselves, skeletons, wet specimens, loose bones, and vials of bones, teeth, claws, and stones! These are perfect for the yearning scientist, beginning collector, or even the bone collector who has it all (secret to my own heart, hah)! Just like the taxidermy, we work as ethically as possible and do everything in house; come in and see the new skeletons and skulls we are working on… our pouncing bobcat will hopefully be ready by the holidays ;) And if you can’t decide, then Curio of the Month is the perfect solution, where each month we handpick items that suit YOU… and not to mention first dibs on new merch in shop shipped directly to you! Figures of Entomology is perfect gift for the aspiring scientist. 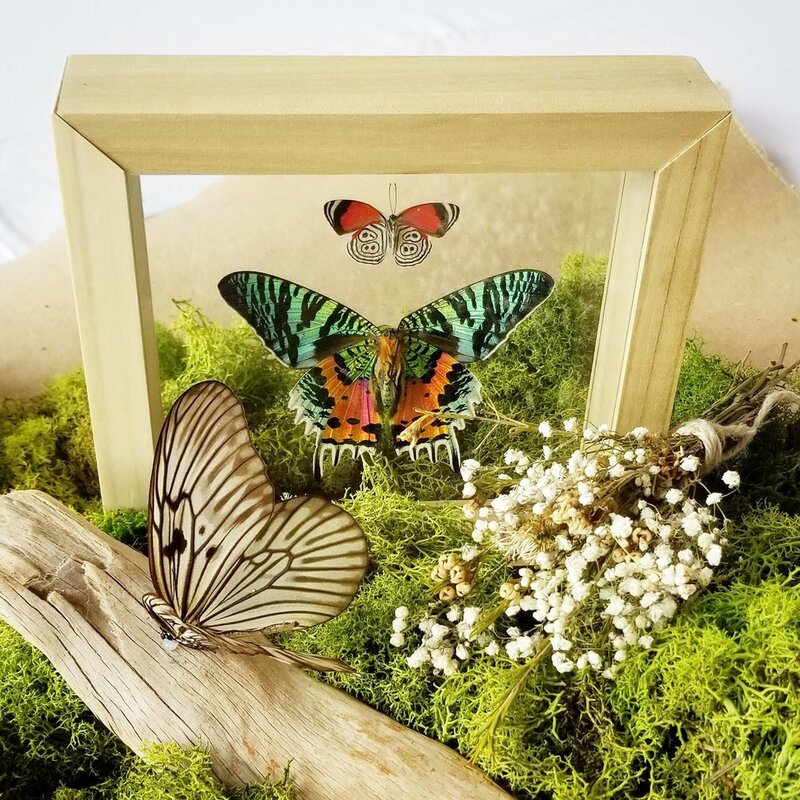 Our handmade frames and spread insects are done here at Oracle, sourced from farms in South America and Southeast Asia where not only do they wait for the specimens to drop naturally but also aids us to protect those beautiful pieces of rainforest… Our double glass frames are also made so you can see the specimens in the round (seeing the interior and exterior patterns of butterflies and those juicy fangs of those beautiful tarantulas). We also will be having a holiday class, Mimics and Disguises, where you can learn how to spread insects yourself! Or… if you are already an accomplished collector or want to practice more bug spreading OR just want to do it yourself, join our Bug Club! We are so thankful for all of your support and our community of science and occult enthusiasts! We wouldn’t be able to put this all together if it weren’t for you all! Thank You! And especially thank you to our local artists and artists we are honored to carry and work with at Oracle. There are so many things that sometimes it doesn’t get to our social media or online store, so definitely try to make it in… Our Holiday Party, Dec 21st & 22nd, is the best way to see all our goodies and meet all the cool people that make Oracle possible - hope to see you then! Bats are unique, spiritually and physically. They are the only mammal capable of true flight. They are portrayed as messengers, gods, demons and familiars in mythology and folklore. There is also a belief in Chinese culture that says that seeing 5 bats flying together is symbol of the “Five Blessings”: long life, wealth, health, love of virtue and a peaceful death. Their use of echo-location makes them symbolic of perception and clairaudience. Bats are social creatures who stay close to their families making them a correspondence to community and nurturing. These Quartz points are filled with inclusions of powdered hematite. It gets it’s name from the Greek word for blood, ‘haima’ but it appears in a range of colors from metallic grey to red-brown. As with any inclusion, Quartz amplifies the healing properties of the Hematite making it a powerful ally for grounding and manifestation. If you need help getting your “head out of the clouds” this is a great stone to ground you in your body. Wearing a piece of hematite daily is one way to feel its benefits as it calls you to pull your dreams and aspirations into reality. Hematite also teaches us balance, courage through tough times and to seek the silver linings in life. Amanda Lee of Pleasesendword is an artist, activist and herbalist based in Kansas City, MO. She wildcrafts elixirs for our most delicate moments. The TAKECARE anxiety tincture is crafted with high quality spirits, this elixir uses the medicine of Milky Oats, Chamomile, Skullcap, Valerian Root and Lemon Balm. When you are feeling anxious and need help returning to yourself, take 2-3 droppers full of the tincture and you will quickly feel the benefits of these herbal allies. You can find more of Amanda’s carefully crafted work at pleasesendword.com. Let us know what you think! What is your favorite? We had the pleasure of being a part of Natalie & David's wedding, a little un-natural history museum sort of way wedding. Natalie has been a collector of specimens for her whole life, always gravitating towards insects and bird taxidermy. So when she approached us to make some centerpieces, we couldn't see how to decorate her a wedding any other way. 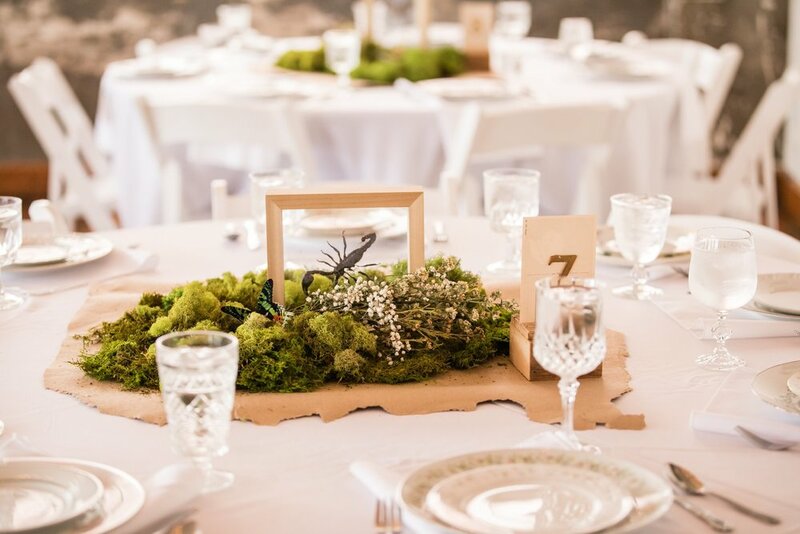 Paper Sun Photography captured the beauty and Fat Plant Society worked with us on the centerpieces, providing the moss and helping us stage the environment for each table. They turned out beautifully! No table nor specimen were alike, which gave the guests the feeling of walking into a personal museum. "Rabbits belong to the order of mammals called Lagomorpha. Working with the rabbit spirit offers an energetic but grounded energy. Symbolically the rabbit represents abundance, cleverness and spontaneity. Rabbits are known for their ability to procreate quickly making them a symbol of fertility. In our lives, fertility can represent not just children but also fertility in manifestation, and creativity. They correspond with the astrological sign of Virgo. " - I love working with rabbit energy, less so for their symbol of fertility but their speediness and keeping the energetic flow fluid. Who can say no to their precious little faces, especially when they are being feisty. Kindness, love, change, luck, desire... but also depicted as a trickster god in folktales. "Rutilated Quartz is a combination of clear or smoky quartz with inclusions of Rutile, which looks like fine metallic hairs or needles that are silver, gold or copper in color. Most Rutilated Quartz comes from Madagascar or Brazil. It is a stone that carries Storm energy activating transformation, cleansing and balancing. Rutilated Quartz is a wonderful stone to work with if you seek to deepen your connection to the Divine and spiritual awakening. It can aid in soothing dark moods and helps relieve fears, anxiety and self-limiting beliefs. This is an excellent stone for those who work as healers or in energetically intense environments because it draws away negativity and protects against psychic attacks." Kim Johnson creates ritual salves for self-care and expansion. Johnson works with ingredients used in Egyptian ceremonies and Ayurvedic Medicine. She also intentionally incorporates the elements of electricity, ether, wood, air, earth, water and fire into each batch. In the shop, we have the mandrake root salve for tension relief and the blue lotus salve for deep dreaming. Each salve comes with a ritual card to guide you through the experience of working with the plant medicine. - I cannot recommend these salves more. I subscribe to Blue Lotus salve right before going to bed; putting it on my hands and neck for good deep breathing and sleep (*definitely put it on when you know you will have a good full nights rest... hard to wake up from if not, or maybe that was just some good deep dreaming?!) Smells divine (not over powering), every ingredient is sourced and mixed with conscious action and the back of each salve even lists what moon cycle it was made under.